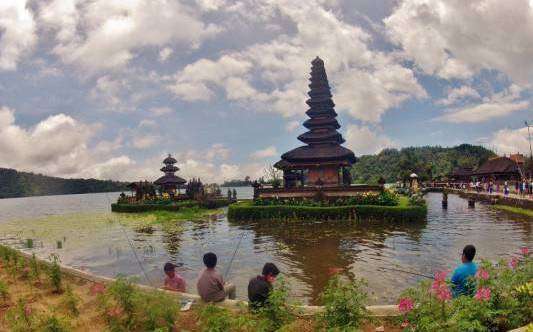 The lovely temple Pura Ulun Danu in the Beratans Lake, is the youngest one (1663) out of the three temples dedicated to the god Dang Hyang Nirartha with his gardens made with lot of love for the details. The oldest one Pura Uluwatu (11th century, Bukit Peninsula) and Pura Tanah Lot (16th century, Tabanan). A little walk on the narrow path down the stairs, passing all the little souvenvenir shops opens the view on the impressive Git-Git waterfall. The little pond invites for some little swim and funny picture sessions, even the water is pretty freezy.